There are way too many Korean BBQ restaurants in Singapore, and one that we tried lately and had a good dinner at is Don Dea Bak Korean BBQ at Kreta Ayer Road. 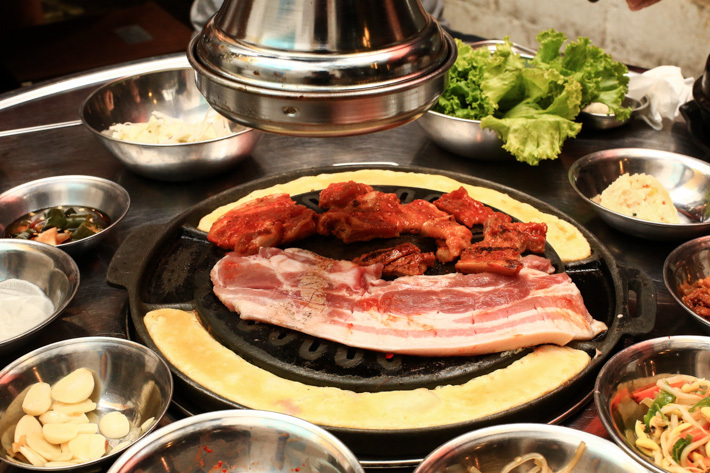 What we love most about Don Dae Bak Korean BBQ is that the restaurant uses charcoal grill instead of the usual gasoline grill. That sure makes a lot of difference to our meats! This small outlet is just like any usual Korean BBQ place – round communal tables that is surrounded by kimchi and pickles (free flow), all your sauces and chilli, and loud Korean pop songs on repeat mode. Don Dae Bak Korean BBQ Restaurant goes by a all-you-can-eat buffet style, with lunch being S$21.90++ per person and dinner at S$23.90++ per person. There is an a la carte option as well, but we say skip that and just go straight for the buffet. The buffet grants you access to lots and lots of meat. 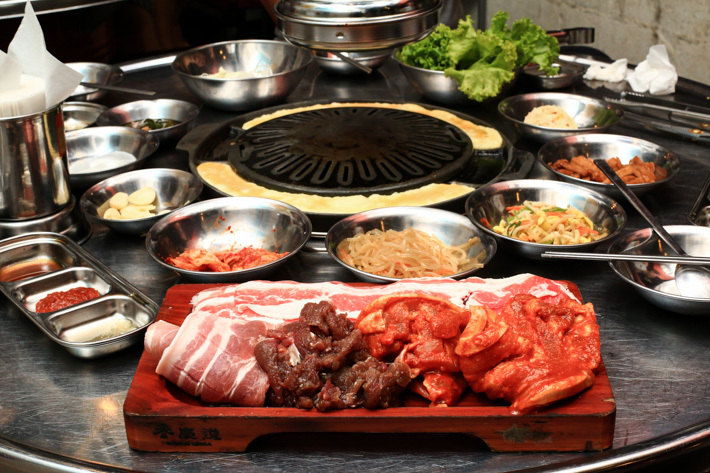 Yes, that’s how a kickass Korean BBQ should be like. Think Marinated Beef, Beef Brisket, Pork Belly, Spicy Pork Belly, Shoulder Loin, Marinated Shoulder Loin, Marinated Chicken, and Spicy Marinated Chicken – ALL.FREE.FLOW. And the cherry on top is the pocket around the grill, where egg custard is poured and steamed egg is made. It is so simple, yet nothing short of comforting; just like the great BBQ meals we’ve had in Seoul, though more often than not, steamed egg is a complementary dish they offer to kid diners. On top of the Korean BBQ buffet, you should also give their a la carte dishes a try, such as Spicy Seafood Tofu Soup (S$12), Kimchi Jjigae (S$12), Budae Jjigae (S$28 for 2-3 pax), Korean Ginseng Chicken Soup (S$15), Kimchi Pancake (S$18), and Spicy Rice Cake (S$7). Hey they no longer open till 2am! Made a wasted trip. You should update.